Football is almost upon us, so let's wrap-up our off-season preview of Michigan State Basketball. It's no secret by now that everybody and their second cousin has MSU picked on their 2014 bracket sheets as at least regional champions. That's more of less what we've been saying since the Cardinals cut down the nets. Watching everybody return (but one senior) was the key to the off-season as we saw it. We also noted the physical size improvements on the team roster. We saw that the returning veterans had a considerable base of experience. We looked at the team stats and saw just about everything coming back. We realized that UM will be in the back-seat to MSU. All off-season reports from the Breslin Center have been positive, if not glowing, most coming directly through Tom Izzo in various comments to the media. Now that Adreian Payne is out of John Beilein's hands, the Spartans are back together, getting ready for the season to come. One of those Michigan Wrestlers who prepared Molotov Cocktails on National No-Title Night will face the music tomorrow. Rosario Bruno will appear before Judge Archie Brown in Washtenaw County Trial Court on Wednesday afternoon. Justin Dozier already confessed to the same crime last month and is awaiting sentencing in August. Both are University of Michigan students on scholarship with the wrestling team, and both played prominent roles for Wolverine Wrestling last season. Each has wrestled in nearly three dozen matches, so they are not "walk-ons". What's most surprising about this situation is that neither of the student-athletes was in one of the various University of Michigan libraries at the time, studying for exams or just for the pure love of learning. Instead, the two were bombing their own neighborhood. The Michigan Mainstream Media Machine (M4) has tried to convince us that the reason athletes attend the University of Michigan is because of the strong academic programs offered there. According to M4, it's the great academic culture that draws in all of the best scholar-athletes. Something about these two guys does not remind me of a Rhodes Scholar. Haven't heard of this story? Wondering if it's really true? Check out all of the links for proof. 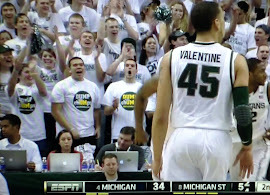 Consider how well-publicized the case would be if it happened in East Lansing with MSU athletes. Perhaps this represents the "Michigan Difference". In Part I, it was shown, using 5-year rolling averages of ranking data obtained from Scout.com that the gap between UM and MSU recruiting rankings was actually following a closing trend. This contradicts the chUMp claims that the gap is widening. At the end of Part I, an interesting trend was mentioned concerning the numbers of recruits in those recruiting classes. A hypotheses was proposed that the trend involving the numbers of recruits might actually prove to show the gap was closing even more than was initially calculated. Before proceeding, we must note that after the 2006 class, Scout changed its algorithm for computing the recruiting class scores. Therefore rankings were used rather than the class scores. Using the rankings imposes a quantification effect. What this means is that the difference between numerically sequential ranks could be caused by a delta score of just 1 or of 1 million. This means that the delta scores between ranks is not uniform. That is always true with any system that ranks scores. Not sure what that means? Let's look at a simple example. The ranks are evenly spaced, but the scores associated with the ranks are not. This is a quantization effect. The reason to mention this is not that it is significant to the analysis. It is actually useful. It allows the different scoring algorithms to be neutralized. To analyze the hypothesis that normalizing the rankings based on the number of recruits was tested. 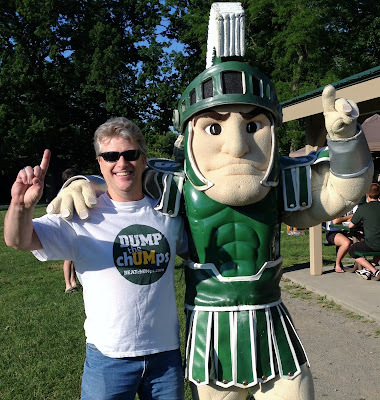 Since the chUMps declared UM was superior the decision was made to leave the UM data as the baseline and normalize the MSU recruiting data to the number of UM recruits. The normalized scores were computed for each year and a new ranking for MSU was obtained from the Scout.com data base using those normalized scores. The Scout.com limit of 25 recruits per class was included in the analysis. Scout.com uses a scoring system that has factors that resemble exponential funcions. Mentioned above was how integer rankings quantizes scores. Scout.com has a scoring system that puts that on steroids. To the aggregate star score is the top 100 points. This means that the higher up in the rankings, the more points it takes to achieve the next higher ranking position. Since UM is generally ranked higher than MSU over the 9 data sets, it seemed worthwhile to reverse the normalization and alter the UM data based on the MSU number of recruits. The trend is not as steep as when the MSU number of recruits is normalized. While it is clear that the analysis supports the hypothesis that normalizing the number of recruits would show that the trend in the gap between the recruiting class rankings is narrowing faster, the algorithm Scout employs for calculating class ranking scores does not support a rigorous analysis leading to a definitive answer. Perhaps the rolling 5-year averages of the win loss records and margins of victory over the same time frame will illuminate. MoV is MSU score minus UM score regardless of winner. The trends are clear. The gap is closing. The only question that remains indeterminate is: by exactly how much. And for how long. The last time we saw these kinds of trends was in the late 1940s when Biggie Munn was transforming MSU (nee MSC) into the Nation's Football Factory. Preface: There is no resemblance whatsoever between the wolf and the wolverine. The former is a noble beast and an ancestral relation to man's best friend. The latter is an ignoble, disgusting carrion eater that, in fact, is a skunk the size of a bear cub. Hence, when referring to those Arrogant Asses, a term coined by Coach Daryl Rogers, the use of Skunkbear (as a pseudonym for a UM troll) is most applicable. Now, on to today's topic. This is not exactly a topic for the lazy or those in need of instant gratification. You are going to have to read and think about this stuff. The topic: The Gap Is Widening? Recent recruiting news has the Skunkbears practically wetting their pants. An over-hyped high school kid has foolishly elected to name that school down the road as his choice. To further exacerbate the matter, another over-hyped kid is considering the same. It is with great glee that the Skunkbears are thumping their collective chests, as if they actually had ANYTHING at all to do with it, and spewing stench over and over again on the many Spartan sports message boards. 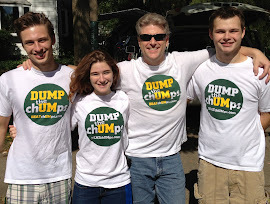 The Skunkbears claim that "Hoke is eating Dantonio's lunch" in recruiting. The Skunkbears claim that "the gap is widening" (and the 'natural order' will be restored). The facts support just the opposite. The gap, at least as far as recruiting is concerned, has been closing. How is one to tell how things are going? 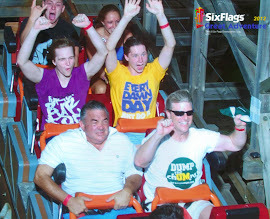 Most are quick to look at the most recent class or the next incoming class and jump wildly to conclusions. While those class rankings might have some bearing, possibly, one must pause and ponder. Since when did a freshman class make or break a team? Certainly not on a regular basis or as a general rule. The point is, if one is going to assess the relative strength of program recruiting, based exclusively on recruiting site rankings, one has to include the recruiting classes that make up the team, year by year. We must digress to make a point. Statistics is a powerful tool for those who know how to use it and comprehend its inherent limitations. Most football "statistics" are little more than averages of aggregate data, the simplest form of statistics and usually abused. For example: The running back averaged 5.0 yards per attempt. Take the total net yards and divide by the number of carries. What does that tell you about his performance? Does it tell you the probability that any given play will result in a long rush? No. Done right, statistics can tell you his "mean value" rush, which defines the distance where half of his rushes are shorter and half are longer. It can also tell you the "standard deviation," which is the delta from the mean (+ & -) that contains 68.2% (1 sigma value) of his results. What good is that? It tells you how consistently the running back plays. Two players can have a mean value of 5.0 yards per rush. One of them can have a standard deviation of 1 yard and the other of 2 yards. The first player can be relied on to gain between 4 & 6 yards a play rather reliably. The other is between 3 & 7 yards. Maybe mentioning the "bell curve" will jog a few memories. The point is that statistics can do things more meaningful than just giving out data averages. What does that have to do with recruiting? Go back to he Skunkbear claim of "closing the gap." That expression literally means they see a trend. Statistics is very useful in describing trends. Trends are results versus time. This returns us to to the earlier point of needing to assess 5-year multiple class rankings. Doing so creates a rolling (or running) average. Rolling averages are good for assessing trends in situations where the data fluctuations need to be "smoothed out" without degrading the results. A typical team consists of 85 scholarship players plus another 20-plus walk-on athletes. NCAA, as a rule, allows a school to offer 25 scholarships in a given year. Couple this with the redshirt rule, which allows a coach to sign the kid and delay the use of eligibility for a year, and in today's game, there are recruits from 5 classes on most teams - true freshmen to redshirted seniors. One could make the point that there are actually only a few freshmen and redshirts that start and so 3 years should be used. The counter point is, when doing rolling averages, a fewer number of time intervals used allows more data fluctuation to shows up in the results. The bottom line is the trend lines become less descriptive and, thus, less useful. In this, a balance needs to be achieved. Scout, Rivals, ESPN, and 24/7 Sports are the Big Four in ranking recruiting classes. MaxPreps assesses high school players. Each has their own scouts/analysts. Each has their own evaluation criteria. Each has their own ranking algorithm. We will save the discussion of those ranking systems for another time. A cautionary note is required. There are 11 years of recruiting data available for each team. Anything less that 100 samples is not statistically significant. The sample size is too small to ensure with less than 5% probability that the results did not occur by chance. The data consists of Scout recruiting class rankings for the year given averaged with the 4 preceding classes. 2014 is based on today's rankings and will change as the 2014 recruiting continues. Scout recruiting data goes back to the class of 2002. The most significant single factor that influences class rankings is the number of recruits in the class. The delta between the rolling averages is reducing, while the 5 year total number of recruits shows a remarkable shift. MSU is doing a better job of retaining the kids they recruit. Bottom line: MSU improved their class rankings while reducing the total number of recruits while UM managed to sustain their rankings but with a significant increase in the number of recruits, which has a big impact on class rankings. It is obvious the Gap Is CLOSING. Moreover, the probability is the gap has closed more than the numbers indicate. Recruiting Is Not An Excuse For Michigan To Be "Back"
There have been more than a few Michigan Men that have declared that Michigan football is “back”. If this is U of M being back, how far have the mighty fallen? Talk about a downgrade in your standards if an afterthought in the B1G race is being "back". But when pressed to why they think U of M is back, Michigan Man ultimately points to recruiting, doesn't he? I will have to admit that Brady Hoke has done a nice job bringing in bodies since his arrival in early 2011, but does that automatically translate to being back? First and foremost, I have to say what an insult to coaches everywhere. This argument essentially states that your job is obsolete because if the other side has better talent they will win regardless of your efforts. Second, I will not even get into RichRod and the fact that he did bring in a lot of talent to U of M even though Michigan Man likes to ignore that. 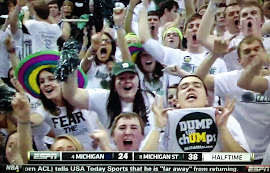 The problem I have is that I have seen this mentality seep into some Spartan fans’ thoughts. The “If we want to win, we need 5-star recruits” mentality. If MSU pulled 10 out of 10 on the Rivals list, I am sure you would be doing back flips. But what does that get you? Let’s look at the 2009 class. That class has had four full seasons to show how they deserved those top-10 spots (meaning if they were the epic college football players they were supposed to be, we should know by now). Did you know that if your team pulled those 10 guys, you would have a total of two guys that became All-Americans? That is the same number of All-American seasons as the 3-star Greg Jones! This is not to say that those 10 players didn't deserve to be ranked that high. Based on the number of them that seemed to get picked up by NFL teams regardless of their college careers, I would say they were all extremely talented. But football is so much more than just being talented. You have to be a fit in a system, you have to buy into the system, you have to have other guys around you that fit in the system, you need to have coaches that are competent in that system and so much more. Mark Dantonio and his staff have done a very good job of identifying guys that fit. Max Bullough is probably not a fit in Nick Saban’s 3-4 defense. Kirk Cousins would be laughable in Urban Meyer’s spread option. BJ Cunningham is probably a role player (redzone/possession receiver) in RichRod’s speed offense. But at MSU they are perfect fits and the coaches put them in the right position to excel. I know there are hundreds of success stories from guys that have made up top-100 over the years (That Terrelle Pryor kid won some football games. But there was that whole disgracing the university thing too). But for everyone of the Julio Jones stories there is a Baker Steinkuhler and for every Ronald Powell there is a Sharrif Floyd. Star rankings do not guarantee anything. Basically even if your team is even able to pull the magical top-10 sweep, there are no guarantees of success. So how important is it that anyone outside of Mark Dantonio and his staff put value in the recruits that are showing up in East Lansing? I, for one, am going to continue to trust Coach D over any ranking system out there. Sparty says, "It's time get your DUMP the chUMps shirt!" Sparty likes this shirt. 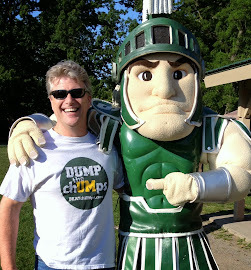 Your Spartan friends would too! This is the year! 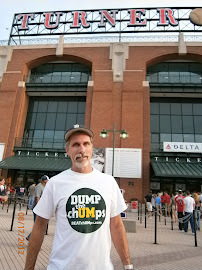 Please send in photos of your DUMP shirt at various events and venues. We will post! The oldest story in the Michigan book has to do with their great academic reputation. They want us to believe that their athletes are on a quest for academic excellence at the "Harvard of the Midwest". They sell their academic reputation as a legitimate reason why athletes should go there, as if those boys were going to be part of any academic quest at all. The Michigan Daily exposed its own parent university years ago in a scathing series of investigative reports on the academic treatment of athletes at the University of Michigan. Turns out a very large percentage of UM athletes were listing "General Studies" as their college major. While we've seen various departments of theirs rank highly on national lists, we've never heard of the prestigious "College of General Studies". Could it be that Michigan athletes were being coddled to greatly assist their chances of making normal academic progress? Now we come to find out that the great University of Michigan Football team ranks dead last in conference academics. That's "last" as in 12th. What's funny is that they wouldn't raise a fuss if they were ranked second, because deep down they accept that Northwestern is a tough out in their fantasy academic derbies. But since they're 12th, they would rather not even bring it up. Which is why we point out that THE UNIVERSITY OF MICHIGAN FOOTBALL TEAM RANKS DEAD LAST IN THE CONFERENCE BASED ON ACADEMICS. Michigan Football blowhard Frank Beckmann has stepped into the national fried chicken market with plans to franchise a restaurant chain to be called "Beck-&-Peck". A spokesman says the venture is meant to celebrate Beckmann's love of freedom and innovation. Beckmann recently wrote about the virtues of fried chicken consumption in American history. The Beckmann chicken chain will offer a variety of new menu items, including chicken fingers, fried-chicken in a bucket, and chicken sandwiches. While those foods may not seem to be "new", Beckmann plans to use his Michigan background to simply tell people things and expect them to believe him whether or not they are actually true. Beckmann said he would not be using his college background to help the company, since he never graduated from college. Many people believe Beckmann would never be considered a "Michigan Man" had he actually attended the university. The "B&P" chain will sponsor a writing contest with prizes to be awarded as each store opens up for business. The essays may be on any subject, but they must be totally idiotic to win. Entries will be judged on stupidity, fractured-flow and disconnect, and other randomly asinine criteria. The goal of each entry must be to leave the judges with only one thought in mind after reading it; "What was that guy thinking when he wrote this?"